Slashing Fossil Fuel Consumption Comes With A Price The U.S. aims to reduce carbon dioxide emissions by 80 percent by 2050. Wind and solar power can help. But folks doing the math say other pricey, controversial technologies — such as burying carbon gas underground, and expanding nuclear power — are also likely to be part of a low-carbon future. Nowhere is that aspiration clearer than at the National Renewable Energy Laboratory. It sits on a hill overlooking Golden, Colo., and suburbs that sprawl all the way to downtown Denver. The researchers at this government-funded lab are in the business of dreaming about a clean-energy future. Some of the scientists drive around in cars fueled with hydrogen. The hydrogen is produced with solar and wind energy, which is used to split water molecules and separate the H from the H2O. Other labs are dedicated to developing new solar technologies. The cost of solar cells has plummeted in the past few years, and the scientists are working on next-generation technologies to keep that momentum going. People have been dreaming about clean energy for decades. And for decades, the world has relied overwhelmingly on the much cheaper fossil fuels. Coal, oil and natural gas made up 82 percent of total energy consumed 25 years ago, and they still make up 82 percent of the world's energy diet today. To find out what it would take to budge from that mark, I sat down with the National Renewable Energy Lab's Douglas Arent in an energy-efficient conference room illuminated only by reflected sunlight. Our results, from a technical nature, show you could meet demand every hour of the year, with up to 80 percent of it coming from renewable resources. Arent co-authored a major study to look at a piece of this challenge. 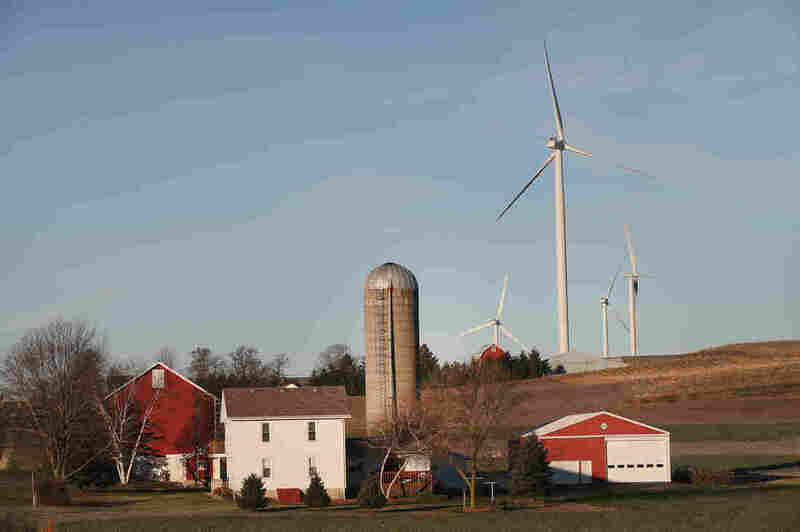 It asked whether the United States could move away from coal and gas, and instead rely on wind, solar and other renewable energy supplies for at least 80 percent of the nation's electricity by the middle of this century. "Our results, from a technical nature, show that you could meet demand every hour of the year, with up to 80 percent of it coming from renewable resources," Arent says. Not to say it would be easy. "The grid would have to be much more flexible," Arent says. "The utility model of the future would have to look different. And of course, in the ... economically ideal case, we would build much more transmission." That vastly expanded transmission grid would help pull wind and solar energy from thousands of miles away, so a windy day in Wyoming can make up for a calm day in California. Those new transmission towers might prove too expensive, or they might generate local opposition. If that happens, Arent says, we'd need to find a way to store a huge amount of renewable power so it can be used when it's needed. "What we found was that there were many pathways, and there wasn't a red flag that said it was impossible, at least at the level that we looked at it," Arent says. One reason this hasn't happened already is that it's counting on a revolution in energy efficiency that hasn't materialized. The plan assumes we'll be able to compensate for ever-increasing energy demand by making our homes and machines more and more efficient consumers of power. Interestingly, the price of generating power from wind or solar turns out to be a comparatively small concern in Arent's analysis. "In many instances and in many markets, renewables are in fact competitive today," he says. There are about a dozen optimistic reports that suggest that our energy future can be built exclusively with renewable sources like wind and solar. But many other analyses say not so, that renewables alone can't go the distance. At Stanford University, Sally Benson heads the Global Climate and Energy Project. She challenges her students to think of reducing emissions from all energy sources — not just electricity, but transportation fuels, gas furnaces and industrial processes. "The big class project is to design a transition scheme that allows us to get from where we are today to an 80 percent reduction in emissions," Benson says. "But I also say, well, you have to think about the industry — you can't lose jobs, and we have to have enough energy so that people aren't freezing and going without lights, and so forth. So it has to be a reasonable scenario." Remarkably, she says, the classes eventually reach a conclusion that mirrors what a lot of expert panels have found when they look at this problem. You can do it, but it takes a lot more than using less energy and relying on renewable sources. The solution the students inevitably arrive at requires steady, reliable and large-scale sources of clean energy. That means capturing carbon dioxide from plants that burn fossil fuel and burying it underground. It also means producing a substantial amount of nuclear power. "So it's definitely an all-of-the-above strategy," Benson says. "You have to do all of them at a really significant pace, and you need to be reducing the carbon emissions every year at a pace of about 2 percent per year, and you need to be reducing your energy use by an equivalent amount." All these changes would come with a noticeable cost. Benson says we would eventually double the investment we're making on energy infrastructure today. It's a big number, she says, "but obviously we spend a lot of money on other things today, and some of that would need to be diverted towards a cleaner energy infrastructure." Clearly the prospect of higher energy prices is a huge problem for an economy that craves cheap energy. But Benson says those higher energy prices would still be a small fraction of the total economy. "I think there's lots of good news on the technology side, and I think [many of] the smartest engineers and scientists at universities around the world ... are focused on this challenge," she says. "And the students love this. This is what they want to devote their life to. So from that perspective, I am quite optimistic." Benson is amazed that more than 10 percent of her colleagues on the Stanford faculty are doing at least some work trying to solve the clean energy problem. And the surrounding Silicon Valley is also full of entrepreneurs looking for ways to cash in. "What I'm not optimistic about," she says, "is what seems to be our total inability to make any decisions, or the society to work together to some of these long, challenging problems." And the longer we wait on this one, Benson says, the harder it gets.